A Colorado partnership sold the Pointe at Wellington Green shopping center for $43 million. The Centre at Wellington Green Ltd. sold the 21-acre property at 10100 Forest Hill Boulevard to the Pointe at Wellington LLC, a company led by Plantation investor Daryl Stair of Stair Property Management. The seller is controlled by Alan Cogen of Boulder, Colorado. The partnership paid $7.75 million for the property in 2002. The 107,368-square-foot shopping center, is 96 percent leased, anchored by LA Fitness. Other tenants include Saito’s Japanese Steak House, Sports Clips, Five Guys, Jamba Juice, Olive Garden, Don Ramon Cuban Cuisine and Franco’s Italian Restaurant. 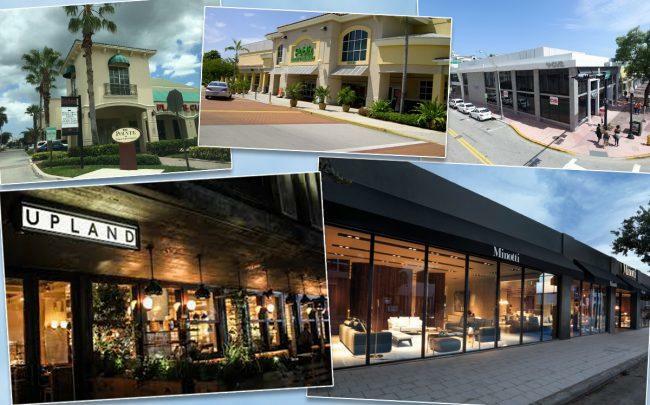 A joint venture between MMG Equity Partners and Global Fund sold a Publix-anchored shopping center in Boynton Beach to Juster Development Company. Whitworth Farms, at 12425 Hagen Ranch Road, sold for $19.35 million. Dennis Carson of CBRE was the listing agent for the property, which sold at 96.1 percent leased. The MMG joint venture paid $11.2 million for Whitworth Farms in March 2013, records show. Commercial real estate firm KLNB paid $18.3 million to buy a CVS-anchored building on Washington Avenue in Miami Beach, two years after it hit the market. KLNB bought the two-story,12,443-square-foot building at 983 Washington Avenue for $1,470 per square foot, records show. Club Invest Group LLC, which is managed by Eugenio Marrapodi, sold the property to the Washington, D.C.-based company. Architect Kobi Karp designed the rebuild of the former office building to deliver it to CVS in 2017. CVS has a lease extending to 2035. The property was originally built in 1936. The site hit the market for $21.4 million in February 2017, meaning it sold for 14 percent less than its initial listing price. The Safra family sold the Minotti building in the Miami Design District to DDC Group, led by Nader Hakakian and his son Daniel Hakakian. Property records show 3817 NE 2nd Owner LLC, an affiliate of New York-based J. Safra Real Estate, sold the 9,770-square-foot building at 3801 Northeast Second Avenue to JJ 3801 Realty LLC, which is controlled by Hakakian, for $15.5 million. The price equates to $1,586 per square foot. Minotti, a high-end Italian furniture factory, has its showroom at the building, which was originally built in 1924 on a nearly 13,000-square-foot lot. Crescent Heights sold a commercial building in South Beach, home to the Upland restaurant, to a nursing home owner for $15 million. Leopold Friedman, who owns the Bronx nursing home Citadel Rehabilitation and Nursing Center in Kingsbridge, acquired the four-story, 32,000-square-foot building at 49 Collins Avenue. It hit the market in 2017. The deal, which breaks down to under $500 per square foot, includes the 7,500-square-foot upscale restaurant and a 180-space parking garage. The property sits on a 13,000-square-foot lot next to the Related Group’s One Ocean, about a block away from Joe’s Stone Crab.